Both Gatlinburg and Pigeon Forge are full of things to do, places to go, and definitely things to “see” like the creative mirror mazes where things aren’t always what they seem. Find out more about these attractions with a little “reflection” on what each maze has to offer. Each attraction is open daily. 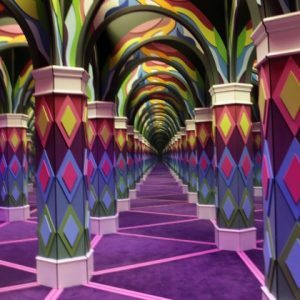 Amazing is exactly what to expect when entering the Amazing Mirror Maze, the largest in Gatlinburg at over 2,400 square feet. Challenge your senses as you enjoy the visual journey of a state-of-the-art show with colorful lights and pulsating music. With so many images leading the way, you won’t know which way to turn, which is the whole point of the maze. Before entering, you’ll put on plastic gloves, to prevent anyone from leaving smudge marks and fingerprints on the glass as clues pointing you in the right direction – and there’s a lot of touching mirrors and people in this game, trying to decide which is real. Never fear, there is an emergency exit with an alarm if you can’t find your way out. The maze takes about 15 minutes or more, and while on the premises you can re-enter the maze as many times as you like. Believe It or Not! Ripley’s has what it takes to show you plenty of smiles on the reflected faces of those traversing the maze. Come face-to-face with yourself, multiple times, along with the faces of other adventure seekers as each of you attempts to navigate the maze from start to finish. Lights on the floor and ceiling reflect flashing colors that add to the surreal challenge. Add a pair of 3-D glasses and take the excitement to another level of fun. On average, it takes about 10 minutes to find your way out. You don’t have to worry about getting lost as there’s an emergency exit and the staff does periodic checks. Each ticket allows entry into the maze, again and again, up until midnight on the day of your visit. Over 3,000 square feet await your attention at Island Mirror Maze where sense and sensibility are tested to the max. Find out how well your internal navigation system works as the challenge lies before you of conquering the intricate labyrinth of kaleidoscope glass. Nothing is as it seems, at first glance, as the mind-blowing experience distorts your view of reality with endless reflections and unnerving illusions. Each step will leave you guessing whether your decision to go this way or that way leads out of the maze, or you’ll if you’ll continue going around in circles. Open daily with unlimited maze attempts for the day of your visit, Island Mirror Maze is a fun-filled destination every step of the way. You’ll be the star attraction at Hannah’s Maze of Mirrors at the Hollywood Wax Museum. While in search of Princess Hannah of Savannah, mirrored corridors and archways cast distorted reflections as you work your way through a maze of over 280 twists and turns. Let King Oscar, the Wizard of the Golden Globe, or Queen Emmy help you find the princess among the many images. Great for kids. A true adventure into creative imagery, The Odyssey tests your mind and senses with a variety of unforgettable experiences. See our feature article on the MagiQuest attraction with 4 great adventures in one venue. The 5,000 square foot maze of sparkling lights illuminates the way among a network of hallways leading to interesting destinations. Let your mind wander into infinity and beyond once you reach the infinity room or holograph hallway. In the dance room, show off your latest moves and watch as the walls dance along with you. TIP – Guests of Cabins of the Smoky Mountains can receive a Free Ticket to MagiQuest as part of our Pigeon Forge Coupons giveaway worth over $400. No matter when you plan to visit Gatlinburg and Pigeon Forge, enjoy the “reflections” of each city for a vacation to remember!